Vision Grills Classic Kamado Charcoal Grill provides its users the flexibility to cook variety of foods with different techniques, including grilling, searing, smoking and even baking. The construction of the grill has been done with premium quality ceramic to reduce heat transfer to the environment and to be durable. It comes with 596 square inches of ample cooking space with stainless steel flip grips. Additional features include two-solid surface drop down shelves to increase the utility space available to users while cooking, a four-wheeled cart for ease in mobility and a vinyl cover. Users have to spend very little assembling the grill as it comes fully pre-assembled. The users just have to set up the cart which wouldn’t take long. 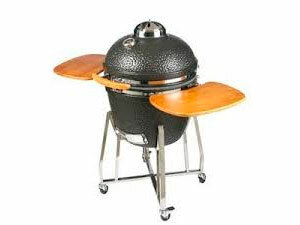 The grill measures 47.25″ H x 23.5″ W x 27.5″ and weighs 198 lbs. The hinge design for this grill has been improved to make the lid exactly in line with the bowl. That way, no heat escapes the grill and it can maintain the required optimal temperature. The lower grate has been added with a flip-up section, to allow users to add smoking wood and charcoal while they are cooking without any major difficulties. The grill has very effective temperature control adjustments to keep the right temperatures inside the grill for hours. With the heat thermometer installed, it is even easier to monitor any temperature deviations. As the cart for the grill comes separately, users might face difficulties in setting up the cart. Users might feel that the grill is too heavy to comfortably lift and fix atop the cart. The design of the cart might not be up to satisfying standards and moving it around may seem bit of a hassle. Once users are past the assembling phase, Vision Grills Classic Kamado Charcoal Grill is very simple, easy and effective to use. Advanced cooking techniques can be achieved by simpler and user-friendly features in the grill. The grill is ideal for those who want a grill which doesn’t require any effort to assemble and use, and still want delicious looking and quality foods.